Hi friends! As you may or may not know, this week finds me on an annual cross-country adventure with my family. 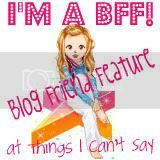 In my place, I have asked some bloggy friends to guest post with some travel tales. Today, I'd like to introduce to my BBM bish, McSpicy, a.k.a. The Homesick Cajun. Hello Everyone! I'm McSpicy AKA the Homesick Cajun. 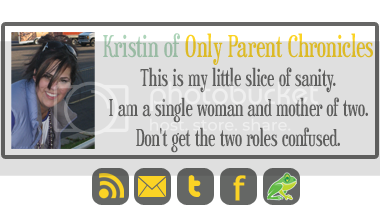 When That One Mom asked me to do a guest blog for her I was all excited! She said that I could do the entry on anything I wanted to as long as it had a "travel" theme. The choice of what to write is easy. 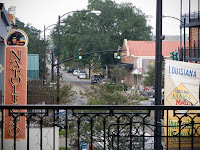 Since I am a Homesick Cajun I knew that I had to write about my hometown. I don’t live here anymore, but my family is still there and I try to visit at least once a year. I'm from New Iberia, Louisiana. (us Cajun’s call it the berry! lol) It’s in southern Louisiana about 2 1/2 hours (132 miles) from New Orleans. New Iberia has a small town feel to it but it's growing every day. If you've ever been to Louisiana then you will understand this...life just moves at a slower pace there. It's laid back, relaxed, it's wonderful. I'm excited to show you New Iberia through my eyes. 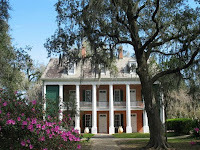 As you drive through New Iberia one of the first things you'll notice are the live oak trees covered in Spanish moss. When I see those trees, I know I'm home. A view of Main Street. 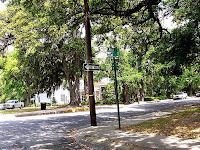 There are huge live oak trees that form a canopy over parts of the street and the Spanish moss hangs down so low in places that it will touch the top of your car. There are huge beautiful homes that line Main Street. 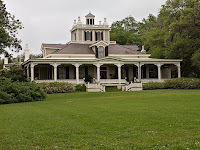 There's Shadow's on the Teche (an antebellum historic house/museum that you can tour). The grounds are absolutely gorgeous! 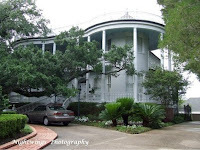 The Steamboat House is a private residence that was built in 1880. One of my friends was a house keeper here at one time. The owners went out of town and we had a massive party. She was fired the following Monday. Lol…oops. Most people don’t realize this but Tabasco Sauce is made in an area of New Iberia called Avery Island. 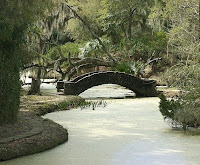 Avery Island is one of the most beautiful places I’ve ever seen. It’s an island that is (on top of a salt dome) owned by the McIlhenny family. They also own Tabasco Sauce. 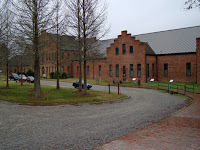 The Tabasco factory is on Avery Island. You can take free tours of the factory. Then there’s the Tabasco Country Store where you can buy Tabasco Products and/or have lunch. My favorite part of Avery Island is Jungle Gardens. It’s 170 acres of lush gardens that you can tour. 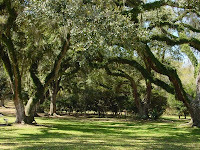 There are massive live oak trees, over four hundred varieties of camellias, over a hundred varieties of azaleas, over fifty varieties of juniper, and, amazingly, over a thousand varieties of iris! (can you tell I’ve been here a lot? lol) Here are a few of my favorite pictures of Jungle Gardens that I found on Google. Stone bridge leading to the Asian garden where the Buddha is. 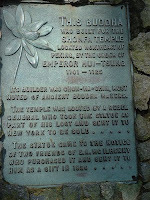 Gautama Buddha, the finest Buddha in America is over 800 years old. Bird City bird sanctuary is one of the largest egret rookeries in the country. It is located in Jungle Gardens also. 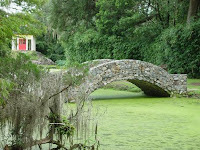 My son was lucky enough to grow up in and around Avery Island. We lived in Avery Island the entire time he was in elementary school. There was (it’s since closed) an elementary school on the island. They had one class for each grade. So the kids he started kindergarten with are the same kids he graduated 6th grade with. It was an amazing experience for him. 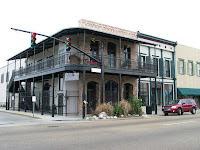 The next few pictures are different places in and around New Iberia that I love. Jefferson house (Built 1870. Home of late actor, Joseph Jefferson who was most famous for his role as Rip Van Winkle) This house is located in Rip Van Winkle Gardens. 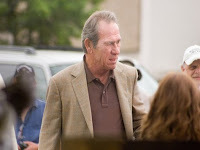 Tommy Lee Jones in New Iberia to film In the Electric Mist. A movie based a novel by James Lee Burke. (the movie was NOT as good as the book) Mr. Burke is from New Iberia and has a series of books who’s lead character is Detective Dave Robicheaux from the Iberia Sheriff’s Department. I’ve read everyone of his books and I’ve met Mr. Burke at a book signing. He’s a really nice man! 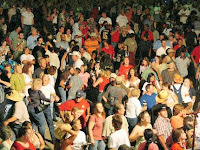 There are several festivals throughout the year in New Iberia. There’s an old saying in Louisiana. “If your grand momma sneezes, we’ll throw a party. And trust me…party they do lol. In September. there’s the Louisiana Sugarcane Festival. This is my favorite festival out of all of them. It last four days. There are four parades, the boat parade, the children’s parade, the farmers parade and the queens parade. 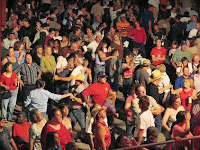 And Thursday, Friday, and Saturday they have Fais Do Do’s (they close down main street and they have a street dance.) . They have bands that come in and play music, beer and food booths. It’s a GREAT time. I’m actually going home this year during the festival and I can’t begin to tell you how excited I am. As you can see, thousands of people show up. People just dance right there in the street, where ever they're standing. In October, they have The World Championship Gumbo Cook Off. This is some of the best gumbo you’ll ever taste!! It’s not just a cooking competition. Everyone in town shows up and parties the entire weekend. But Louisiana isn’t just about all that I’ve shown you so far. The best thing about Louisiana is the people. The people in Louisiana are some of the friendliest people you’ll ever meet. Thirty minutes after meeting you they will invite you into their home and they most definitely feed you. Cajun people are very proud of their cooking skills. I know I am. I can cook up a mean pot of chicken and sausage jambalaya and a really good pot of gumbo. That brings me to my next subject. The food. Good Lord I don’t even know where to start! crawfish etouffee, fried alligator, boiled shrimp, gumbo, sauce picante, meat pies, boudin, blue point crabs, king cake, beignets…I could go on and on, but I’m making myself hungry lol. Did you know that in Louisiana they have drive thru daiquiri places? How amazing is that people? Where else can you drive up to a window and order a 32 oz daiquiri (with an xtra shot, or two if you’d like) and drive away? You can also order them by the half gallon, or gallon too lol. My sister and her husband own a restaurant and bar in New Iberia that also has a drive thru daiquiri window. Take a look at the list of daiquiris, if yours isn’t on the list…just let them know and they’ll make it for you if they know how lol. Well, this concludes my tour of New Iberia, Louisiana through my eyes. There’s so much more that I’m sure I’ve forgotten. The heart of the Cajun people is huge. You’ll never meet friendlier people! And now you know why I call myself a Homesick Cajun! What a great post Cajun!! Now I know I just have to put this on the list of stops to make when I convince Ward to take me on a long road trip! I would loev to go to Louisiana. I went through it once in the middle of the night on our way to TExas..
Beautiful, the pictures look almost surreal! Mmmm...fried alligator is sooo good! Lol... 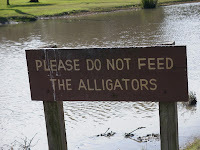 Honestly, you don't really see that many alligators there. okay...I am almost ashamed to admit that I didn't know that about Tabasco sauce being made there OR how beautiful Avery Island is!! I think we might have to have a little field trip there...it is beautiful!! Growing up in Baton Rouge I can't believe I've never been to New Iberia! You did such a good job selling it I think you could work for the Chamber of Commerce. Living in Texas I've really come to appreciate TREES. And I miss them - especially Live Oaks. Years ago on vacation with my grandparents we drove through Texas to Colorado and my grandfather proclaimed that there wasn't a tree in the entire state. What they call trees here are laughable. My daughter and I just returned from BR and she was amazed at the drive-thru daiquiri places and hard liquor in the grocery stores. OIL (only in LA). My grandmother was born on Jefferson Island, which is spitting distance from Avery Island, so I feel even closer to you now. And knowing you like Mr. Burke too, well girl I can hardly wait until September and the Sugarcane Festival. When I was growing up in Texas, I couldn't drive 25 miles to Beaumont because I would have to get on the freeway but I could drive 'across the river' to Louisiana because as my mom puts it, "That is God's Country". Good thing too because the drinking age was still 18 there but 19 in TX...lol! I have to say that even though I'll always be a Texas Girl, my heart really does feel at home now that I live in LA. Great post homesick! My husband's cousin got married on Jefferson Island at dusk. It was beautiful!! 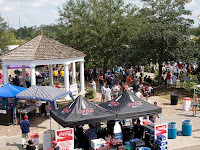 And you know the food thing down here is in full swing right now with lent going on...crawfish abound! I've never been .. not yet, anyway! Some day, tho. And OMG, drive-thru daiquiris!?! STOP IT! WHat more could a gal want? I want in!